Create a stylish and contemporary bathroom with Zack's exclusive luxury glossy stainless steel floor standing towel stand from the Scala collection. 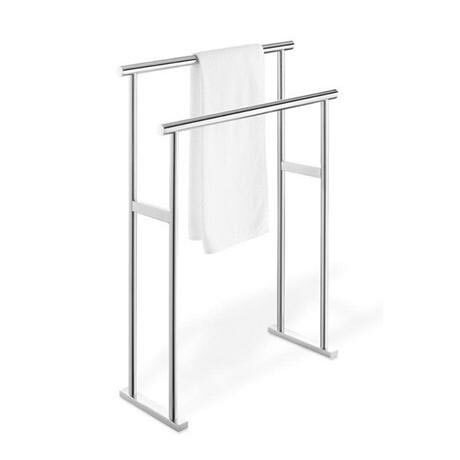 This towel stand is manufactured from quality 18/10 stainless steel with an outstanding glossy finish. The minimalist soft rounded forms of this sleek gleaming towel stand would fit in harmoniously into a wide variety of bathrooms. It has 2 durable parallel arms for resting your towels or clothes on. A stunning freestanding towel stand can be moved anywhere in your bathroom, to a place that suits you best, for your convenience. It is made from a durable and robust stainless steel and finished in a high gloss for added style. This towel stand from Zack evokes a spa like effect in any bathroom, which is a popular trend. Hi, the Zack Scala Stainless Steel Towel Stand has a depth of 22cm and a width of 60cm.Thanks. Hi, the width of the Zack Scala Towel Stand is 60cm. Thanks.